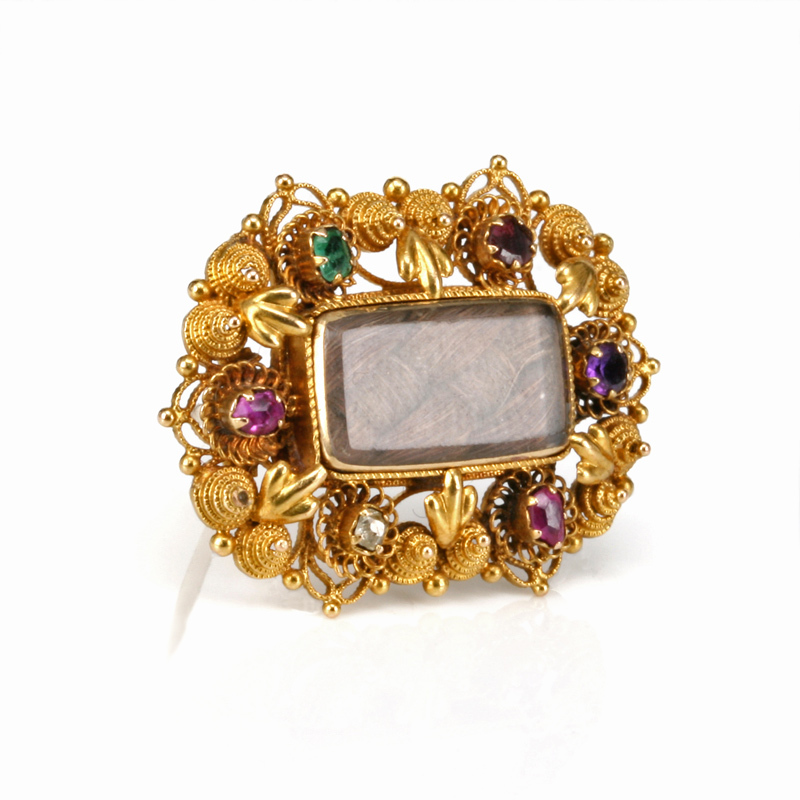 Product code: ES6438 Categories: Antique, Antique Brooch. Acrostic jewellery is where the piece of jewellery has gemstones that “spell” out a word and here is one of the finest examples with this antique Regard brooch from the 1840’s. Set with a ruby, emerald, garnet, amethyst, ruby and a diamond, the first letter of each gemstone spells the word “Regard”, and this would have been given to a loved one with such a romantic sentiment attached without it being too obvious. Made in the very early Victorian period, this Regard brooch is exquisitely made in 18ct yellow gold with the most divine detail around the border and the gemstones. 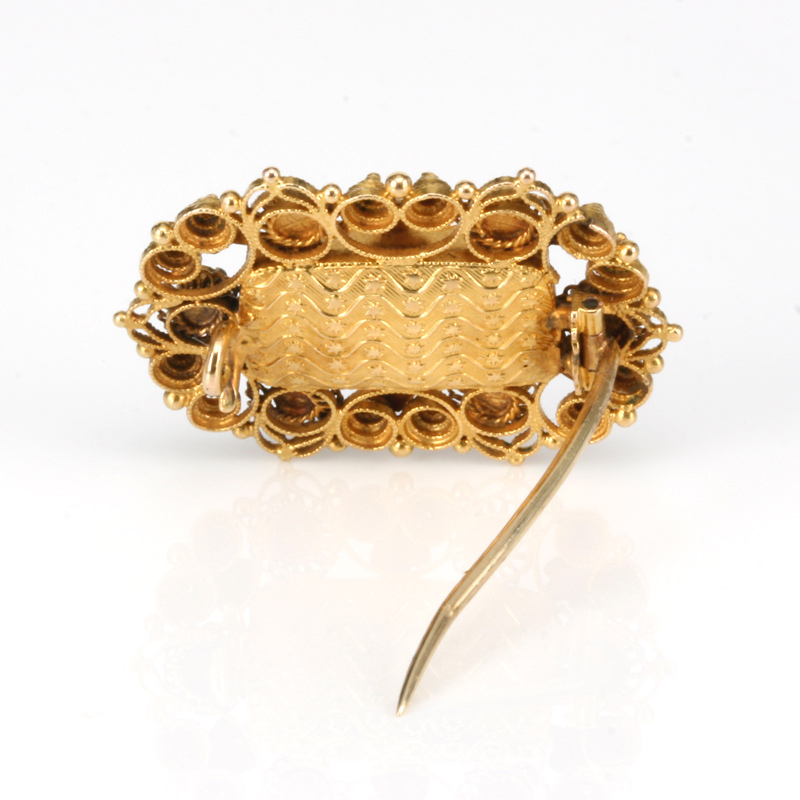 Then in the centre there is a locket of woven hair which adds to the charm and character of an already very romantic Regard brooch. This would not have been a mourning brooch as there is no black or inscription as was typical for such a piece and during the Victorian times, jewellery made from hair was so popular it even surpassed the price of silver per ounce and was highly sought after to be fashioned into jewellery. The brooch measures 27.3mm across by 20.6mm and turning the brooch over reveals the most magnificent and highly detailed hand engraving. This is one of the finest antique Regard brooches around and one that is in equally superb condition.